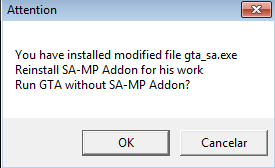 nonamenoname, in 2.0 mod version appears a file "anticheatexit" and close my gta sa after loading bar. OBs: no crash registers. Unhandled exception at 0x006F6B80 in gta_sa.exe (+0x2f6b80): 0xC0000005: Access violation reading location 0x00000004. Can you please do something so I can turn frame limiter on? 60fps or 200 is almost the same thing, but my laptop heats without any sense and I always let it on so it won't. Or is there any way I can set it to 60? I tried some ways, but no chance. I really appreciate your work. I installed using the .exe setup and appears the same .txt and closes my game. I did not remove any files. Is there any incompatibility with MixSets because only appears when it is in use. Unhandled exception at 0x006F6B92 in gta_sa.exe (+0x2f6b92): 0xC0000005: Access violation reading location 0x00000000. SAMP load the server, after I have this crash in 3 seconds in game or more. I tried alternating .txt's, but not solved. I fixed this no need to answer. But I do have another problem. Everything is working fine but sometimes when I rotate camera or something like that I get these weird flickering white textures for a second or two, it's really irritating. I also get some white/purple-ish screen when I alt-tab back into the game for one second, it's nothing like really serious but it's irritating. Hi ! i have a problem with Samp addon 2.0, when i open the game and i minimize it and then i want it to maximize its not opening. can u help me please? It supports SilentPatch, or I put one of the two? I have a little problem. There's two mods I use, a custom GTA IV HUD and a sprintbar. The sprintbar fails to appear (It's a .cs file) and the HUD refuses to show the health, armor, money and location (The HUD works, it shows the health bar and armor, but not the percent/number). Are there any files that might be effecting these mods, and can I possibly remove them? hey, u make an awesome work but i cannot see the players names, how to see them again? Hey, the game is kinda freezing every 2 seconds. It doesn't freeze when I go out of bounds, past 6000x6000 (meaning water only). It doesn't freeze as much while running/walking, it freezes alot while driving/flying through SA. I turned my draw distance right down and right up, still happens. How do I turn off mipmapping?